but about issues many midlife women face. Coupled with our own menopause issues and getting older is the reality that our parents and/or other loved ones are aging - many of them elderly already and others who are coping with the ravages of Alzheimer's. the role of caregiver and simply don't know how to cope with all the demands of caregiving. 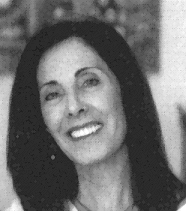 Sandy Braff, M.S., M.F.T., is a Licensed Marriage and Family therapist in private practice in the San Diego area. As we are aging ourselves, we often find ourselves coping with our loved ones aging -- suffering from dementia or Alzheimer's disease and becoming the caregiver. You must be able to survive one emotional upheaval after another. Caregivers have been known to put their own lives on hold and become entirely devoted to caregiving - making this difficult role even harder, and often compromising their own health. Being a caregiver, or simply watching those we love go through this difficult time, can wreak havoc on our nerves, cause major anxiety and depression. associated with staying connected, while letting go. 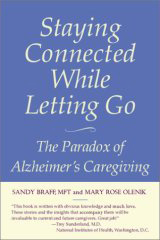 Staying Connected While Letting Go: The Paradox of Alzheimer's Caregiving." Since 1989, she has voluntarily facilitated a weekly Alzheimer's Caregiver's Support Group for the San Diego Alzheimer's Association. She also facilitates a monthly support group at a local Alzheimer's facility.